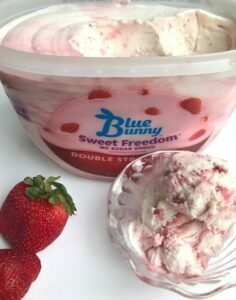 Blue Bunny Sweet Freedom® Ice Cream - Bring On Summertime! 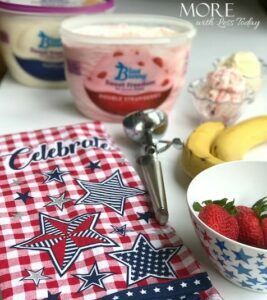 Blue Bunny Sweet Freedom® Ice Cream – Bring On Summertime! This is a sponsored post for Savings.com. All opinions about Blue Bunny Sweet Freedom® Ice Cream are my own. Nothing says summertime like ice cream. Growing up, we always had ice cream at home when the weather got warm and the nights got longer and it is still one of my favorite desserts. It brings me back to my childhood and sweet memories of catching fireflies and playing tag outside. If you love ice cream like I do but are trying to cut down on sugar, I have delicious news to share. 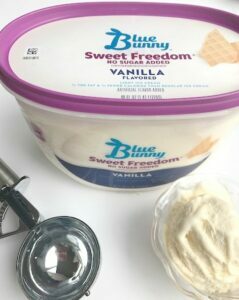 Blue Bunny Sweet Freedom® Ice Cream, sold at Walmart, has no sugar added and you won’t even miss it. Yes, it’s lower in sugar but it’s high in flavor. When enjoying ice cream at home, you can set out a toppings bar and let everyone customize their own creation. I like to keep it simple and just add some fresh fruit. I’m always watching what I eat and trying to make the best choices. To me, a diet should be a way of life that you can live with forever. It doesn’t mean not eating the foods we enjoy. Sometimes it means eating less of them or finding a lighter version. I don’t want to feel like I am missing out the way I do when I’ve tried to follow restrictive eating plans. I love the Vanilla and the Double Strawberry and I’m looking forward to delving into the Chocolate choices soon! Which ones would you try first? Yes, it is hard to choose. 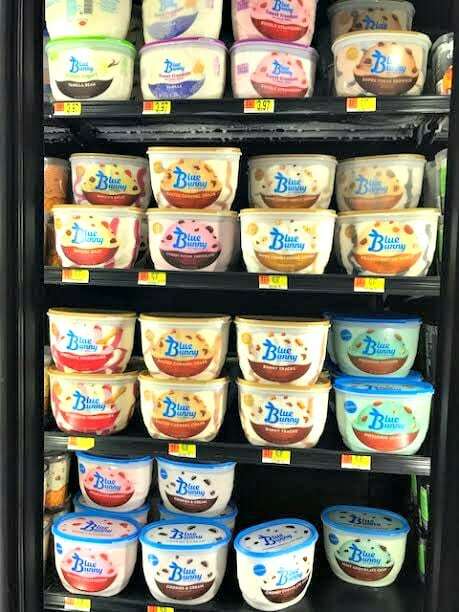 Here is a picture from the freezer section at Walmart. YUM! You can learn more about Sweet Freedom and the available flavors here. Check your Valpak envelope and you can get an additional $1.00 off Blue Bunny Sweet Freedom coupon. (not available in CA or LA). Both coupons are redeemable at your local Walmart. Both the Valpak coupon and the printable coupon above are redeemable at your local Walmart. Enjoy one the best of summertime with no deprivation at all! Oh my gosh, sugar-free ice cream?! Yessssssss this is perfect for when I need an ice cream fix, plus my sweet toothed husband would appreciate it as well. I definitely want to try the vanilla & chocolate flavors, hopefully, my next trip to Walmart they’ll have these available! I think the double strawberry my husband would like the most! OMG sugar free ice cream that taste amazing? YESSSSSSS please. I totally am a ice cream fanatic and this sounds like something I would be so in love with. Totally going to check this out. I have never tried sugar free ice cream, but I’m willing to give it try. I will be checking this out next time I’m in the ice cream aisle. TY for all the ice cream info. We spend our summers in Italy so you can imagine how much gelato we end up eating in two months, lol! It’s so hard for me to enjoying ice cream back home after that!! sugar free ice cream!? This is just the ticket for me. I so need to try it. I love ice cream too, but I don’t love all the fat and sugar. Blue Bunny ice cream sounds like a great solution. It looks really delicious too. I’ll have to check my local Walmart to see if they carry it. Having sugar free options is such a great way to enjoy the fun and flavor of summer through ice cream without the added sugar! Love that Blue Bunny makes this possible in such a fun way.